High atop Mt. Hope Cemetery once stood a towering structure known as The Fandango, rising above the treeline to offer visitors a breathtaking view of our city and the Genesee winding its way out to Lake Ontario. 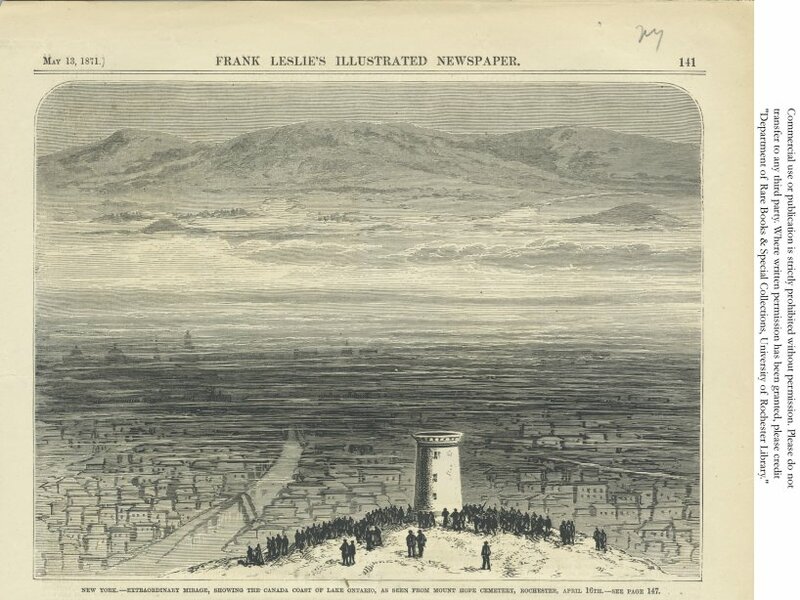 On a bright clear day, April 16th of 1871, early visitors to the tower marvelled at the unusual vision it afforded them: the landscape North of Main Street appeared as though it had radically changed overnight. As word spread throughout the day, it became clear to the thousands who gathered there to witness the spectacle that they were indeed not seeing Rochester at all, but instead found themselves able to make out the opposite shore of Lake Ontario in vivid detail. Lakes, forests, and Canadian landmarks were all somehow made easily identifiable to the naked eye despite their actual distance of over 50 miles away. The phenomenon lasted for one day, and to this day the spectacle of the Rochester Mirage remains unexplained. However, one possible and plausible explanation is that of Fata Morgana, an optical illusion caused by extreme atmospheric temperature inversion, which as part of its effect is known for bending light in such a way as to make objects far beyond the horizon line appear both visible and magnified. A similar event to The Rochester Mirage occurred in Buffalo on August 18, 1894. The city of Toronto's harbor became visible to the naked eye, in vivid enough detail to make out church spires, despite an actual distance of over 110 miles away. A steamer traveling from Rochester to Toronto, beyond the horizon, was also reported as being made visible during the course of this mirage. Though there are few major recorded instances of this phenomenon occurring in Western New York, if Fata Morgana is the culprit, then with the right conditions this spectacle could grace us again any day. Great Lakes Newspaper Transcriptions Search: 'Mirage' - revealing many instances of similar phenomena throughout Lake Ontario's history.